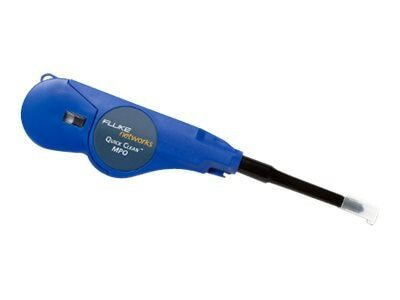 The Fluke Networks QuickClean-MPO Cleaner is designed used to clean MPO/MTP connectors with either UPC or APC polished ferrules. Unlike traditional swab cleaners that rely on the technique of the user, the Quick Clean Cleaners provide consistent cleaning every time. The user can easily engage the cleaner using a simple push motion and the user will hear a "click" sound when the process is completed. With the click of a button, any fiber installer or data center technician can clean up to 500+ fiber ports. These cleaners are designed to fit into pockets without contamination from dirt and grease.